Description: A yoga-themed music CD for kids! Each fun song teaches a pose or sequence through music. The sweet songs on this CD are a perfect companion to a kids yoga class. I use some of the songs on the CD to teach yoga poses. I also play the CD in the background while we color mandalas and work on crafts. KayLee Smiles has the voice of an angel, and her calming, creative songs are a fun addition to my class. I like that the songs are specifically geared towards yoga, as some children’s music can be too hectic for setting the mood of relaxation. “Cat Cow”– Super fun song for flowing from Cat to Cow. Lots of Meows and Moos to keep it fun. I’ve had this catchy tune stuck in my head all week! "Proud Warrior”- Great song for flowing from Warrior 1 to Warrior 2 and Warrior 3. Beautiful melody, and a fun drum beat. "Melt Melt Melt"- Nice and relaxing Savasana song. My absolute favorite holiday and theme for kids yoga is Valentine’s Day and Love! I LOVE this time of year. I love passing around a stuffed heart and hearing what kids say who and what they love. I love doing dancing and freezing to “All You Need is Love”. And I love leading love-themed guided imagery, like the "Love Balloon" and "Loving Kindness" from Imaginations and Imaginations 2. Sending love to the people you love (and to the people you don’t) is calming and therapeutic. The Loving Kindness meditation for kids is always a free download from BambinoYoga.com because I just don’t think there can ever be enough love sent around!!! -Form a heart with your hands, back of fingertips touching and thumbs joining below ("Heart Position", pictured above). -Lift your pointer fingers and touch the fingertips. -Bring them back to Heart Position. -Lift your middle fingers (Pyramid Mudra). Use heart stickers to help all kids see that we all have hearts! Like these. Have each child put a heart sticker over their heart. It is a good visual to help kids understand the idea of sending love to someone else's heart! The fun part of using these stickers is that any yoga pose becomes a Valentine's Day pose! Benefits: Fun! Also, helps conceptualize love and our Heart Chakra. A children’s book about a yogini named Lucinda. Lucinda goes on an adventure and does yoga poses along the way. The story is written in free verse and rhyming poetry with beautiful illustrations that demonstrate the yoga poses. I have been following Betty Larrea’s blog for several years, and she always has fun kids yoga ideas to share. This book captures the magic of Betty’s enthusiasm for kids yoga. Fun intro to yoga for kids written by a kid’s yoga teacher. Nicely sequenced poses that flow from seated to standing, and then back down to the floor (or bed for bedtime). Colorful illustrations that show Lucinda doing each pose. Traditional yoga poses that all the kids in my class already know, including Balloon Breath, Butterfly, Frog, Tree, and Bridge. Ends with Lucinda in bed, resting, which transitions nicely to Savasana and a guided meditation from my books, Imaginations or Imaginations 2. Betty Larrea is a Yoga Alliance Registered Yoga Teacher who has been teaching yoga to children since 2001. She founded Be Yoga Be Love and is currently providing Author Visits, her yoga curriculum, staff development training, and event services for children, families and educators in schools, libraries, and yoga studios throughout NJ and NY. Win a copy of Lucinda's Magical Yoga Adventure and Imaginations 2! Enter the Rafflecopter giveaway below by January 31st, 2016 at 11:59 PST. US entries only. Ah… Summer… My class schedule slows down, and I finally have time to focus on my teaching and writing business. I schedule time to reflect on my business, create and write new products, and market my services. Two fabulous tools that I rely on for this are The Marketing Guidebook for Kids Yoga Teachers by Jodi Komitor and The Biz of Kids Yoga (“TBOKY”) Online Course. I re-read the book, and review my notes from the TBOKY course. Then, I evaluate what I am currently doing well, set goals for improving areas of my business that need work, and get started! This process has helped me to write a second book (Imaginations 2), post more frequently on this blog, and have a more consistent social media presence. I’m so excited to be offering you, my dear readers, the chance to win one of these tools in June! They have both helped me gain clarity and focus in my business, and I think you will find them as helpful as I have. I consider the TBOKY course and the guidebook like taking your kids yoga business to a yoga class. Your business comes out relaxed, refreshed, and focused! Enter the giveaway here for a chance to win either a “seat” in The Biz of Kids Yoga 8-week Online Course or The Marketing Guidebook for Kids Yoga Teachers by June 30th at 11:59 PM PST! The Marketing Guidebook for Kids Yoga Teachers is a 39-page PDF booklet filled with practical marketing tools specific for Kids Yoga Teachers. 1. It is specifically for Kids Yoga Teachers! There is so much marketing advice out there, but you have to hunt and peck for information that applies to our industry. How wonderful to have a resource like this, just for us! 2. It is well organized. There are clear sections relevant to any kids yoga instructor, regardless of how long you have been teaching. Traditional marketing (like flyers and business cards) as well as online and social media marketing are covered. She also explains that you are “marketing” just by connecting with your community and being your own fabulous you. 3. Each section has a Take Action box. These boxes give specific ways to put the marketing ideas into work for your own teaching business. This is where the magic happens, when you take her ideas and use them to reflect on your own marketing. 4. It is written by a leader in the kids yoga industry. Jodi has been teaching for years, and she has one of the most successful kids yoga businesses out there. How lucky that we can learn her secrets to success. 5. It compliments and reinforces the Biz of Kids Yoga (TBOKY) course that Jodi also provides. I took TBOKY a year ago, and it is nice to have this guidebook as a refresher on the ideas shared in that course. Purchase and more info here. The Biz of Kids Yoga™ (aka TBoKY) is an 8 week online course where you join together with other Kid Yogi-preneurs to learn specialized business education that will take your offerings to the next level. This class was previously reviewed here. In summary, I loved that it was based on the experience of a kids yoga teacher, well-organized, collaborative, convenient, and open-ended. It was like taking my business to a yoga class. Don’t forget to enter the giveaway here for a chance to win either a “seat” in The Biz of Kids Yoga 8-week Online Course or The Marketing Guidebook for Kids Yoga Teachers by June 30th at 11:59 PM PST! Winners will also receive a copy of Imaginations 2. I recently read Yoga Journal’s article, Wake Up + Revive with 3 Sun Salutation Practices. It shows Sun Salutations from the Kundalini, Yin, and Ashtanga perspective. I love how one flow can be transformed using different yoga styles. It got me thinking about kid’s yoga and our different styles of Sun Salutations. There are so many ways to transform this flow. This is good if you want to do Sun Salutations every class, but you also want to keep them new and interesting. If I am working with a group for an extended period of time, I always do Sun Salutations for each class so that the children can see their progress week after week. -Play music (“Mr. Sun”, Kira Willley’s “Dance for the Sun”, and the Beatles “Here Comes the Sun” are all fun). -Use affirmations with each pose in the flow ("I am calm", "I am strong", etc.). -Teach the Sanskrit names of the poses. For the first round, use English. For the second round, use Sanskrit. -Take the class outside and do Sun Salutations in the sun! -Use props like paper plate suns, rainbow ribbons, or even pumpkins! -Focus on the breath by only cueing with “Inhale” and “Exhale”. This will work well once a group knows the poses by heart. -Similar to singing in a round, where each group starts at a different time, have each person around the circle start their Sun Salutation when the person next to them is in Extended Mountain. You can do one round this way so that there is an endpoint, or have them keep going until you ring a bell telling them to wrap up their last round of Sun Salutations. Need even more Sun Salutation ideas? Check out this blog post from Full of Joy Yoga. Have fun and Happy Sun Saluting! - Up and Down- Have kids keep their heads and necks still, but move their eyeballs to look up at the ceiling and then down to the floor. -Left and Right, Side to Side- Keeping head and neck still again, have kids look to the left and to the right. If they don't know their left from their right, say things like "Left to the Door, Right to the Window" to give them clues about which way is which. If you are facing the class, don't forget that your right is their left, so you have to "mirror" your directions. -Have kids close their eyes and gently tap their fingertips on their eyes. If you are teaching to girls with long fingernails, remind them to use the pads of their fingers, not their nails. Try using Eyeball Yoga when transitioning from a high energy activity to slower poses and notice how the energy of the room shifts! If you are using these exercises at home, notice if your child seems to fall asleep faster by helping the eyes relax. Have more Eyeball Yoga ideas? I'd love to hear about them! Bring a bonsai tree to class and place it in the center of the circle to set the tone. 4. Sprout one arm and then the other. This ideas came from a YogaKids training. 1. Write the names of the characters from the book (animals and the woodchopper) onto cards. These are acting parts. 2. Read the story, and have the kids act out their part by doing the corresponding pose when their character is mentioned in the story. 3. You can also read the story first, and then have the kids act it out from memory to reinforce comprehension and retention of the story. Earlier this month, I posted “10 Ways to Help Kids with Stress” here in honor of Stress Awareness Month. One of those things was yoga! (Of course!) An easy way to introduce kids to yoga is through a DVD. Each DVD has 4 yoga practice sections, each approximately 15 minutes. I love that the DVDs are divided into these mini-sessions which include warmups, active poses, and relaxation time. This makes it easy to integrate the DVD into a classroom or home routine with little “bites” of yoga. Of course, kids will probably want to do more than one section since they are such fun! The DVDs are geared towards kids ages 5 and up, and I have found that this age group LOVES kids yoga classes with dinosaur or outer space themes. What kid doesn’t romp around like a dinosaur or blast off into space? Gaiam and Jodi clearly know their audience. The background sets are colorful and fun, and there are kids doing the yoga poses along with Jodi. Her instructions are clear, and she is able to not only teach the kids, but also interact with the DVD audience. Gaiam’s Yoga for Kids Dino-Mite Adventure and Outer Space Blastoff DVDs with Jodi Komitor are a great combination of learning, fun, and yoga! Jodi transports kids with their imaginations using dinosaur and outer space poses and activities. These videos are must-haves for any parent or teacher wishing to share yoga with kids. Find out more about Jodi Komitor and Next Generation Yoga here. For a chance to win a DVD and an Imaginations book, enter the Rafflecopter giveaway here. Gaiam’s Yoga for Kids Outer Space Blast Off with Jodi Komitor and a copy of Imaginations: Fun Relaxation Stories and Meditations for Kids. Enter the giveaway here by 11:59 PM Pacific Standard Time April 30, 2015. 10 Ways To Help Kids With Stress- April is National Stress Awareness Month. While most adults are aware of the stress in their lives, it is important to remember that kids feel stress too. Dance ribbons are so fun to use in kids yoga classes. You can buy dance ribbons on sticks online, but sometimes it is hard to hold the stick and do yoga poses at the same time. So, I prefer to make my own (or have the kids make them themselves) using rubber bracelets. Rainbow ribbons and tuille are tied onto a bracelet, and then kids can put them on their wrists for a hands-free dance ribbon experience. Any yoga pose is fun with these dance ribbons, but they are especially fun for painting rainbows and freeze dancing. Don’t skip using the tulle ribbon. The tulle gives the ribbons more “body” and helps the ribbon stay in the air longer, instead of just hanging down. As you paint in the air, the tulle and ribbons float behind your hand so you really do feel like you are painting the air. Check out the bottom of the page for a downloadable The End of the Rainbow Lesson Plan Package that uses these Rainbow Ribbons. -Tulle Ribbon - This ribbon helps keep the ribbons floating in the air. Find it in the wedding section of a craft store. Decide the length of the ribbons and tulle you want for the prop, and then double that measurement. For the dance ribbon in the picture, 4 feet of ribbon was used to make a 2 foot dancing ribbon. Try making the ribbons the arm’s length of the child for dancing, so two arm’s lengths for cutting. Tie them closely together on the bracelet or tie both pieces on at the same time like in the picture above. 3. Do some yoga or dance with it! Now slip the bracelet on your wrist and paint some rainbows! P.S. My neighbors officially think I am crazy after watching me take pictures of myself dancing with Rainbow Ribbons in the street! 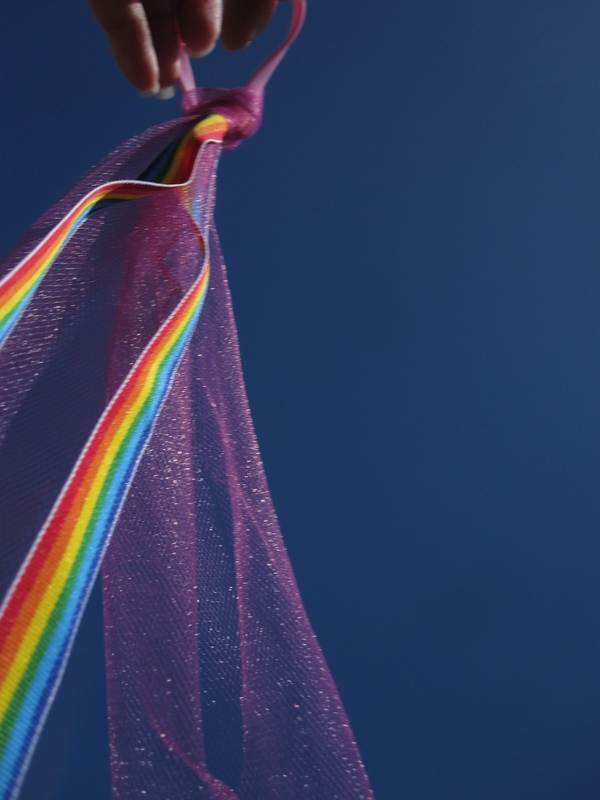 We've created an entire lesson plan that uses these Rainbow Ribbons! You can download The End of the Rainbow Lesson Plan Package, which includes "The End of the Rainbow" relaxation story from Imaginations 2. It includes rainbow poses, games, a "recipe" for making a rainbow, and time-extender activities. Last year many of you participated in a survey to let me know what guided imagery products and services you'd like to see. The majority of you asked for Lesson Plans with Guided Imagery as your top choice for products. I have listened to what you want and created the first ever Bambino Yoga lesson plan. It is a love-themed lesson plan, perfect for Valentine's day or anytime you want to teach about love, and includes the relaxation story of the month "Loving Kindness". I think you are going to LOVE it (haha!). Full lesson plan with poses, props, and suggested verbal cues. A love-themed relaxation story from Imaginations: Fun Relaxation Stories and Meditations for Kids. I am offering this first lesson plan for free until February 15th. I am hoping that by providing it for free, you will be so kind as to offer feedback so I know what you love or don't love about it. Are the holidays feeling hectic? Here are a few things to bring a little relaxation into your home or classroom during these busy December days. Plop down in the snow (or the sand if you live in SoCal! ), and make snow angels. Inhale: Move your arms up over your head and move your legs out. Exhale: Move your arms down and legs in. Look up at the sky, take deep breaths, and feel the joy! With each present you wrap, each card you stamp, take a moment to feel gratitude for the person it is for. Share a funny story, think of a nice thing they’ve done, or just send them some love. Share this practice with your kids and students. Hold a cinnamon stick to your nose and take deep slow breaths in and out. Smell the holidays! Try winding down with some yoga at bedtime (or anytime you need to bring the energy down). I love Giselle Shardlow’s Good Night, Animal World. Happy Holidays! Remember to breathe and take in all the moments of this holiday season! It’s an exciting time in the world of kids yoga. When I started teaching yoga in 2002, I didn’t have any local resources or fellow teachers. Only a handful of kids yoga books existed. And most people had never even heard of kids yoga, let alone someone who only taught yoga to kids for a living. Now fast-forward 12 years: We’ve had our first national meeting of the minds—the National Kids Yoga Conference in DC. There are multiple books and resources specifically for kids yoga, like Giselle Shardlow’s Kids Yoga Stories and Lisa Flynn’s Yoga for Children. And now… drumroll… kids yoga is coming to TV! Bari Koral launched a musical yoga TV program called Yogapalooza with Z Living Network this fall. YogaKids has a pilot for the YogaKids Magical Garden that is being considered by major networks. And now Shakta Khalsa, of Radiant Child Yoga, is teaming up with Yoga Dog to create a live and animated TV show for kids. With childhood obesity being a major problem, we need to bring movement to the kids in a fun and easy way. If we can’t get kids away from the screens, let’s bring movement to the screens—with yoga! Shows with yoga will get kids moving during TV time, instead of just staring at the TV. Yoga on TV will be fun. A television show can introduce kids to the active movement and balancing poses of yoga and then transition to the stillness of yoga in a colorful, musical, and fun way. 3. TV reaches kids we can’t. Certain barriers can prevent a child from having the opportunity to practice yoga. Money and transportation, as well as geography, can be limiting. And of course, even the best yoga teachers can only be in one place at a time (so far), and we can’t bring yoga to every child in our community at every hour. A TV show that runs on every TV in every home could reach the kids that we can’t. 4. Yoga brings positive messages to TV. There are negative messages on kids’ shows today. Some of these messages, like violence, are obvious. Some are more subtle, like racial and gender stereotypes. Kids yoga programming is a chance to counteract those negatives with positive messages of self-love, compassion, and non-violence. We need any and all positivity streaming on the airwaves! 5. It reaches kids in their comfort zone. We talk often about yoga being a great form of exercise for kids with obesity, but an overweight child may not feel comfortable in a public class environment. Having yoga on TV can offer those children with body image issues an opportunity try yoga poses in the privacy of their own home first. As their confidence grows, they may be more comfortable in a public class. Rainy or snowy days at home or school can lead to boredom and inactivity. The convenience of turning on a TV show will lead to more opportunities to practice yoga! Which leads to more peace, love, and exercise. 7. It offers repetition and reinforcement. 8. TV can educate the masses. Fear of the unknown has lead to “shenanigans” like a lawsuit in Southern California involving a school that offers its students free yoga. Kids yoga on TV would help educate the public on the benefits and appropriateness of yoga for kids by showing it for what it is—a system of stretching and breathing that makes kids healthy and happy. Nothing scary here, just fun and relaxation. 9. Promoting kids yoga is always a good thing. Having kid’s yoga on TV helps promote the idea of kids yoga overall. As a yoga instructor, I’m looking at every kids yoga TV show as free marketing and promotion. Some teachers might have the gut reaction of, “Oh no, if everyone is watching kids yoga on TV, who will come to my classes?” I would argue that kids who watch the shows will fall in love with yoga and ask Mom and Dad for more yoga. Then Mom and Dad will discover the amazing classes in their community and enroll them! So, now you are probably really excited and wondering what you can do to help support kids yoga on TV. Lucky you! Shakta Khalsa, one of the world’s leading experts on children and yoga, and Jennifer Foster, founder of Kids’ Wellness Alliance, are running a Kickstarter campaign to create a TV show called Yoga Dog. The 22-minute children’s program focuses on imagination, emotions, and movement. It follows the adventures of Yoga Dog, an innocent, fun-loving pup, and his friends. If pumpkin spice lattes, muffins, and ice cream aren’t enough, now there is Pumpkin Spice Yoga for Kids! I love using mini-pumpkins as a fun prop for kid’s yoga. They are an inexpensive and natural way to spice up (sorry, couldn't resist!) your class. Look for ones that have short stems. -Set up mats in a circle with a pumpkin on each mat. Write your name on the bottom of your pumpkin. (Or write it for them ahead of time). Give a few sprays of a spicy essential oil- like cinnamon or clove (always check for allergies). Now you have your Pumpkin Spice! Look at your pumpkin. Notice the color, the shape. Take 5 deep breaths staring only at your pumpkin. Sitting down, put your legs in a “V”. Put your pumpkin on the floor in the middle of the “V”. Reach your arms up, and over your legs reaching for your feet. Take a deep breath in and out while in the oven. Ding! It is done! Balance your pumpkin on your back (or belly) depending on which version of Table you are doing. Or, try both! Curl up into child’s pose and hide your pumpkin underneath you (tucked under your body, arms, wherever you have room to hide it.) Imagine you are a seed planted in the soil. The rain comes and gives your seed water, now it gives it sun. Let your seed sprout! Hold onto your pumpkin and “sprout” your arms up. Come onto your knees and lift your arms high in the air holding your pumpkin. Namaste Pumpkin- Stand up in Mountain and bring hands and pumpkin to your chest. Flying Pumpkin- Reach your pumpkin up to the sky. Plant a Pumpkin- Bring your pumpkin to the ground (hinging at your hips). Set it down. Pumpkin Lunge- Step one foot back into a lunge (your pumpkin is cheering you on!). Lizard Smells a Pumpkin- Stretch back one leg, and then the other for Plank Pose. Stick your lizard tongue out and smell your pumpkin. Snake Smells a Pumpkin- Drop your knees down, legs straighten and chest lifts up for Cobra Pose. Smell that pumpkin with your SSSSSSSSsnake tongue! Dog Smells a Pumpkin- Press back into Downward Facing Dog and imagine that you are a puppy dog smelling the pumpkin. Dogs love to sniff and smell everything! Pumpkin Lunge- Step one foot forward into a lunge (your pumpkin is cheering you on!). Pick a Pumpkin- Step one foot and then the other into Standing Forward Fold. Pick your pumpkin up off the earth. Flying Pumpkin- Bring your pumpkin up to the sky. Namaste Pumpkin- Bring your pumpkin to your heart. Put your pumpkins in the center of the circle. Practice some balancing poses while focusing on your pumpkin. Crab walk to your pumpkin, pick your pumpkin, and then table walk back to your mat with your pumpkin on your belly. Lie on your back and hold your pumpkin up in the air with your feet. Lie on your back and put your pumpkin on your belly. This is a version of the "Planting a Seed" story in Imaginations. You could also use "A Fall Day" from Imaginations 2 if you are using this lesson to celebrate fall. Imagine that you have a magical seed in your hands. Whisper a secret to the seed. Tell it you’d like it to grow into a pumpkin. Now dig a hole in the ground. Plant your seed in the hole and cover it with dirt. Imagine that it starts to rain. Water slowly soaks into the soil. Now the sun comes out and shines brightly on the garden. You start to see a tiny sprout poke up out of the soil. Tangled roots grow down into the ground. And grows into a beautiful pumpkin. What color is your pumpkin? What shape is your pumpkin? What is special about your pumpkin? Enjoy looking at your beautiful pumpkin. I hope you LOVE using mini-pumpkins as much as I do! Have other ideas for using them in yoga classes? Share them in the comments section below.